I'm not posting as often as I would like since I've been extremely busy with work lately. I do apologize and I hope you'll be patient. The craziness at work should settle down in the next five or six weeks. I'm still trying to bake and post for Daring Bakers and YWPWT, but I haven't had much time otherwise. I've dug back into my Flickr archives and found this lovely tart I never posted. The crust is an almond cookie crust with some grated orange zest. The zest is optional, but I think the combination of orange and almond works really well with the raspberries and chocolate. The chocolate filling is a truffle cake batter with some raspberry jam mixed in. The batter is baked in the prebaked cookie shells and then I topped the tarts with gorgeous fresh raspberries when I was ready to serve them. 5. Whisk the flour into the chocolate mixture. On low speed, add the chocolate mixture to the eggs all at once. Scrape down the sides of the bowl and continue to mix until well combined, about 1 minute. Add the raspberry jam and mix for another 30 seconds. At this point the batter can be refrigerated, tightly wrapped, for up to 5 days. Or you can use it right away. 6. Pour batter into the seven prebaked tartlet shells. It's okay to fill the shells all the way to the top. (You might have some batter left over.) Bake at 375F for 13-16 minutes until the filling is just set and slightly wobbly in the center. Allow tartlets to cool for at least 30 minutes. Carefully remove the tartlet from the pans. Top with fresh raspberries and serve. 1. In a food processor, add the ground almonds and sugar and pulse to combine. Add the butter cubes and pulse about 15 times or until no loose bits of almonds/sugar remain. Add the flour, zest and salt and pulse about 15 times or until the butter is about the size of small peas. Oooh, such a richly decadent tart!! Love it. Hang in there with the busyness, Mary!! that is the most perfect tart I've seen in a while. stellar photo too. Yum! They look so pretty too. Am glad this came out of the archives. Beautiful. i love little treats like this. you know i am a chocoholic but the crust has gotten me excited here! A real treat for our tummy! Una tarta maravillosa, pero por favor podrías instalar el TRADUCTOR GOOGLE en tu blog, te escribo desde España. Gracias. 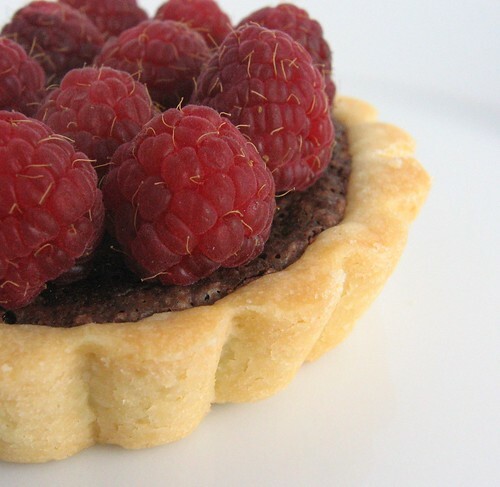 And I just really need a raspberry chocolate tart! Beautiful Mary. Fantastic!! I love so much little treats. Here's to getting back in the kitchen soon. Beautiful photos! I like this tart too. It looks so yummy! Hi Mary. I love your blog! My favourite recipe so far is your Almond Lemon Tea Cake. 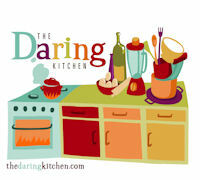 I'm baking so much lately that I need to buckle down and buy a stand mixer and food processor. As far as food processors are concerned, what size would you recommend? Would a 7-cup be large enough for baking? Or should I opt for a 9-cup? Anonymous from 5/22/09 - Glad to hear you enjoy my blog. I think my food processor bowl has a 9 cup capacity. I don't think I would go much smaller than that. Thank you Mary. I was worried that I would have to buy a 12-cup. The nine is still pricey but I think it will be worth the investment. My poor little food prep. is so tired from the amount of work I make her perform.